I love a good cheeseburger. But how apt am I to dig in if it means Alzheimer’s or another disease later in life? An American or Western diet is a poor choice for many reasons. It can lead to obesity, diabetes, vascular disease and even cognitive decline. A recent study sheds light on how and why this may happen. A western diet tends to include highly processed, less expensive fast food having a high fat content and simple carbohydrates. It often lacks essential nutrients from complex grains, fruits and vegetables. A team from Tufts University/The Jackson Laboratory (JAX) replicated this diet in mice with some interesting findings. After eating a simulated western diet, they found a dramatic increase in the immune response activity in the brains of all mice, including those that didn’t model Alzheimer’s disease. In previous research, different elements of a the western diet have been associated with the development of peripheral inflammation. This study’s findings strengthen the possibility that immune activity (a hallmark of inflammation) in the brain increases susceptibility to Alzheimer’s disease. We know that a diet high in fruits, vegetables, whole grains, lean protein and omega-3 fish similar to a Mediterranean diet is better for our brains and bodies. 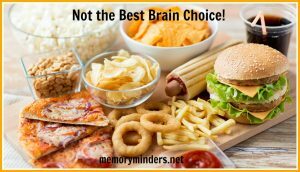 This study is more proof that the current American or Western diet can be detrimental to our brain and cognitive wellness. Changing our diet takes willpower, organization and determination. It means stepping out of what may be easy, comfortable and familiar. Change can be difficult, but often oh so worth it. Maybe you know someone with heart or vascular disease, is overweight or experiencing cognitive difficulties. You see how it’s impacted their lives as manifested by heart surgery, a stroke, lower quality of life or memory decline. If not eating a cheeseburger and fries can make an impact on any or all of these, it’s worth the effort! Let’s choose wisely when it comes to diet. Your brain, heart and future self will thank you!